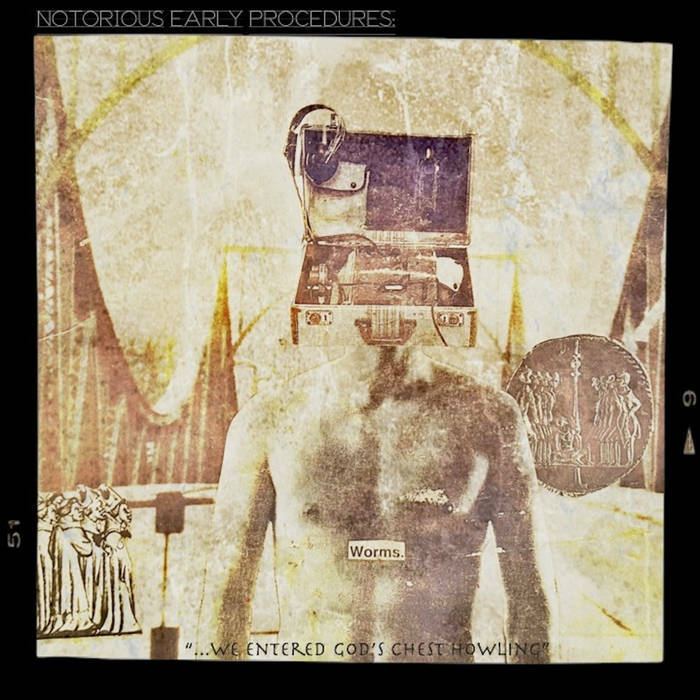 "...We Entered God's Chest Howling..."
NOTORIOUS EARLY PROCEDURES is a new international musical duo made up of Max Brody (ex-MINISTRY, PINK ANVIL, TEST APES, etc...) who lives in the USA, while Daniele Santagiuliana (TESTING VAULT, ANATOMY) resides in Italy. They have never been face to face, and met each other through the social media. Despite coming from two different backgrounds of alternative music (more song oriented the first, more conceptual the other), they created a nice friendship to the point where, sharing their passion for common bands and sounds, they sent each other various audio files; which the other processed, played, and co-wrote, creating a virtual jam session over the ethers for their own enjoyment. This unexpected collaboration now is at their debut! --if you like the sound of the most hysterical and experimental releases on IPECAC RECORDS, and the music of bands like early DOWNLOAD, HELTIR (the experimental side project of Rozz Williams), LAFMS, all under a more modern electronic disguise, you are going to love the newly dubbed NOTORIOUS EARLY PROCEDURES EP "We Entered God's Chest Howling", a release born from a chemistry that has just started to bear its' fruits. We also have a PHYSICAL CD RELEASE available in a limited edition of 66 --with 3 separate covers (22 copies of each cover will be made), which can be purchased via the maxbrodyworld.com store or the looney-tick productions store. Recorded in 2016 between USA and Italy. by Max Brody and Daniele Santagiuliana.